Was the message after completing this weekend papers word search. 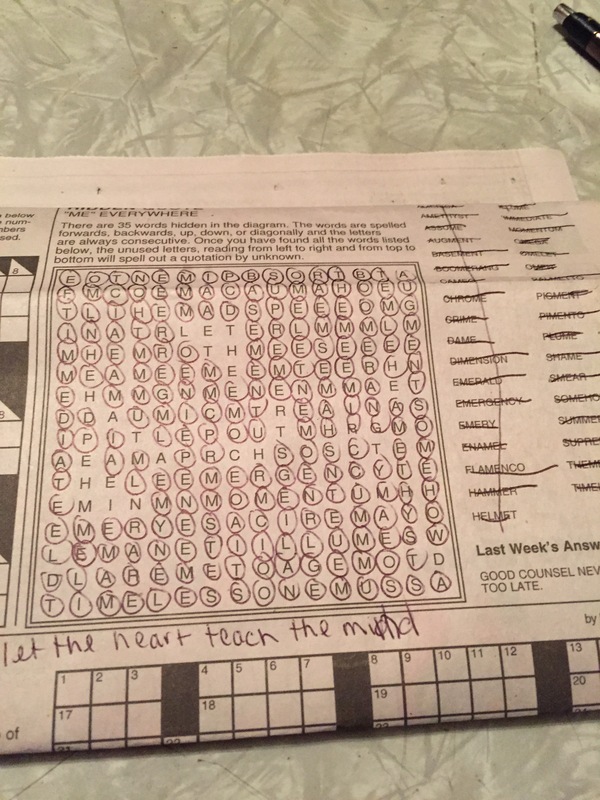 Completing the word search on a Sunday, I recall from my childhood, is just as warming as the smell of sauce cooking for a family dinner. Our Sundays, growing up, were free from to-do lists and were spent visiting family. I had a aunt that lived in Niagara On The Lake, a quaint little town where I spent some time growing up. The long drive there went quickly as thoughts of a cardboard box of ice cream would always be waiting and who’s turn it was to get the box! As there would be several of us there it was easy to finish a carton of ice cream. If it was your turn to get the box, you proudly got to peel back each flap and clean that sucker clear of every bit of creamy delight. The long drive to visit passed quickly with thoughts as well to the weekend newspaper which my aunt also saved for us. Huddled behind it, we, as children would find great humor in the funnies. But then, it was time to get down to work with the word search. Numbers, math, wasn’t “my thing” but oh letters and words!!!! Whether it was from doing word searches or growing up in an era where a question “how do you spell ……” posed to a teacher often came with a reply “look it up in the dictionary”. WHAT! The frustration under your breathe, “how can I look it up if I don’t know how to spell it!” Grrrrrr. You always found it though……right! Then there was a teacher I had in high school. It may have even been a math teacher After every test/quiz there was a word search. After you gruelled through the test and if there was time left in the period, you got a sheet filled from top to bottom, from left to right with a word search. I’m pretty sure it was math because I ALWAYS had time left over on account I didn’t understand half of the test. Now I want you imagine little Ralphie in “A Christmas Story” when the teacher asked the class to write a paper on what they wanted for Christmas. He gets all happy, starry eyed and wiggly in his seat. Yep, that was me when I got my word search. For every word you found you got half a point. Find two words, one full point. These points would be added to your test score. So not only did I love the mental exercise of find backwards, upside down, diagonal words but I loved knowing I’d pass the test with points accumulated. What a great teacher. I don’t remember their name, but what a great teacher. So, recently, I’ve been getting a mental workout, growing my vocabulary, childhood satisfaction, remembering my visits with my aunt (minus the ice cream). All through a mumble jumble of upside down, backwards, diagonal, forward bunch of letters.